Due to incentives offered to physicians by Centers for Medicare and Medicaid Services (CMS) for using electronic health records (EHR), physicians have been experimenting with different ways to do this that are both efficient and cost-effective. Physicians have tried sitting at a computer and entering data and clicking boxes during the patient encounter. Many find this approach interferes with doctor and patient interaction. The focus is on the computer, not the patient. Other doctors have tried using scribes who enter the examining room with the doctor and enter information into the computer during the patient encounter. Having a third party in the examining room is uncomfortable to some doctors and patients. Dictation and medical transcription coupled with new technology streamlines productivity, increasing patient satisfaction while implementing and improving EHRs. Focus is on the patient, not a computer. Instead of sitting at a desk facing a computer screen and manipulating a keyboard and mouse while you try to find the right icon to click, you give your patients the full attention they expect. Patient satisfaction is greater. Patients report dissatisfaction when they feel your attention is on entering data into a computer instead of on them and their needs. 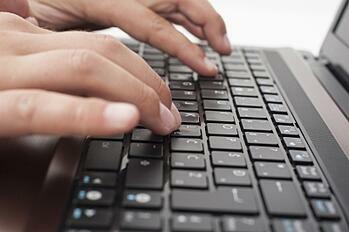 You can customize the medical transcription program to meet your specific practice needs. New software allows you to customize the program with the unique features of your particular practice. You can create templates that reduce dictation and transcription time thereby saving you money. Design documentation that meets your needs. There are flexible methods of documentation. Use a telephone, handheld digital recorder or even a computer, or mobile app with speech recognition. Your dictation is transcribed to fit into the templates you have created. You do not manipulate your dictation to fit the templates. Narratives are more efficient than box-clicking. Instead of impersonal information entered by clicking a box, you provide a narrative of your patient encounter. The clinical record is then created by medical transcription and you efficiently move on to the next patient. Narratives provide a more complete picture of the patient encounter. A narrative allows you to fully record observations and assessments of the specific patient’s condition. Some information cannot be captured by point-and-click. The medical transcription that flows from dictation presents a more complete picture of the patient’s condition. The narrative is also more useful to a consulting physician if you need to refer a patient. Medical transcription narratives reduce coding errors. A narrative approach allows billing coders to more accurately determine the correct code, thereby substantially reducing coding errors. This saves you time because the coders can find the answer in the medical record without having to call you and ask you questions about the care provided. Medical necessity for insurance coverage is more easily documented with medical record narratives. Insurers may go back to the very first record of the condition when determining whether any requested surgical, orthopedic or radiology procedure is medically necessary. A narrative history increases the odds for medical necessity insurer approval. At Healthcare Information Services (HIS), we have a long-standing relationship with Emdat. Emdat's dictation and transcription technology coupled with our medical transcription services provides you the efficiency and cost-savings solution you are looking for. The total cost of documentation is reduced and you have the flexibility of creating a program unique to your needs. You have the freedom of dictating at the time and location that best meets your needs. Contact us here for more information and see all the advantages medical transcription provides.